When Frenchmen speak English, it's always hilarious. 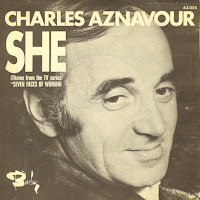 And even on this classic recording by Charles Aznavour, you can't help but grin at the heavy French accent in this beautiful little song. 'She' was released in 1974 and reached number 1 in the UK singles chart and number 18 in the Dutch Top 40. The single did not have any success in the USA or France. Anavour also recorded the song in French, Italian, Spanish and German. The British duo Vegas recorded a great cover version of 'She' on their eponymous and only album, released in 1992. 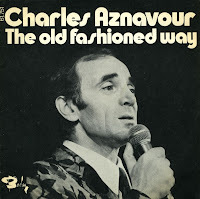 Charles Aznavour was born in Paris, France on May 22, 1924. Often described as the 'Frank Sinatra of France', he's one of that country's most popular and enduring singers and also one of the most wellknown singers in the world. One of his signature songs is this romantic track, 'The old fashioned way'. It is the English version of Aznavour's French song 'Les plaisirs demodes'. The single, released in 1973, reached number 38 in the UK singles chart and number 4 in the Dutch Top 40. Aznavour also performed the track in an episode of the Muppet Show in 1976.